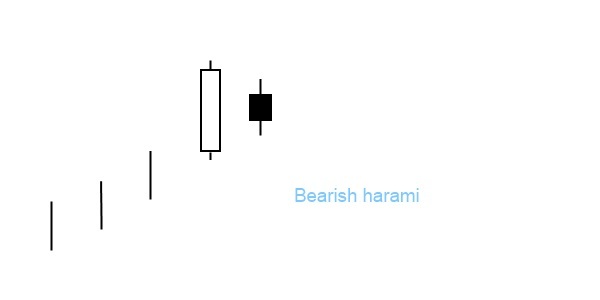 Bearish harami is a two-line pattern. It consists of a white body and a small black body that is completely engulfed by the body of the first day. The pattern appears in an uptrend and forecasts its reversal. The first line can be any basic candle with a white body. The second element can be any black basic candle, appearing both as a long or a short line. The smaller the second candlestick, the more likely the reversal. If the small candlestick is a doji, the chances of a reversal increase more. How to identify bearish harami cross? When the harami pattern appears, it indicates that the market is losing impetus in the dominant direction. The harami consists of a small real body that is contained within the preceding large candles’ real body. The first candle is strikingly larger than the other candles around it. Bearish harami has a variation named three inside down and its bullish version: bullish harami.